There are many types of hydroponic systems and here we will cover the basics with the most popular being the Ebb and Flow, Drip Systems, NFT and Aeroponics. An ebb and flow system is a hydroponic system that utilizes a pump and gravity to push the nutrient solution up to the plants, and then drains the solution back down to a reservoir. The reservoir, therefore, must be below the growing container. An ebb and flow, or flood and drain, system will have a container on top that holds pots which hold your plants. 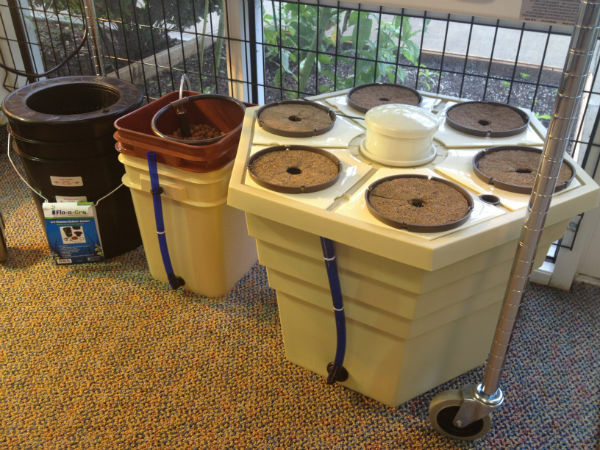 In these pots, you put your growing medium (Rockwool, Hydroton, etc.) and then place your plant in the growing medium. When the pump is turned on, the nutrient solution pushes the CO2 rich air up and out of the pots. This process then works in an opposite way as the nutrient solution drains back down. Gravity pulls oxygen rich air into the root system, giving them the perfect balance of prerequisites for their photosynthesis and growth. Many growers will have an automatic nutrient pump and drain cycle to ensure the plants are watered frequently without having to manually turn the pump on. This will also be a haven for the plants because they understand what to expect and run their cycles efficiently. A standard schedule would be to water the plants for about an hour several times a day, however, this watering schedule should vary depending on environmental conditions, the plant size, and the type of plant. Another benefit to this method is that when the flow drains through, it splashes in the reservoir creating additional aeration. Ebb and flows are perfect for growing giant plants that are densely packed together. The most commonly used hydroponic system on the market, drip systems are notorious for providing plenty of aeration and being fairly easy to set up. They work by having a tube stretched from the reservoir (attached to a pump) to the top of the container holding the pots. The tube is stretched along the row of plants like a sprinkler system you see in commercial set ups. Solution is then cycled through the tube, through the plants and roots, and then back into the reservoir. This method provides more aeration than the ebb and flow system because you never actually completely flood the plants. It has the same aeration adding effect as the ebb and flow because it drains down into the reservoir. There are many different ways in which to run this system. You could run it in intervals, based on plant needs, anywhere from 30 minutes on/off to an hour and 30 minutes on/off. Or, you could leave it on all the time. Experimentation is the only way to know for sure how the timing affects your plants. A system using the nutrient film technique produces very good harvests and is often the choice for commercial setups. The way this system works is by having PVC piping or a tray holding pots and have it angled down. The bottom part drains off into the reservoir which, in turn, pumps the water back up to the higher side of the tray or piping. This causes water to drain down, preferably shallow, or looking like a small “film,” hence the name. It therefore touches all the roots constantly but still provides plenty of aeration, given that you keep the film level low. Smaller plants are usually preferable when growing in an NFT system because the trays or piping you use are usually not going to be big enough to support very large root systems. A small 4 inch net pot is not going to hold the same amount of roots as a 5 gallon bucket, and if you try to, the roots will clog the lane and pathogens could develop. Aeroponics is the most refined method on the market today and is still being slowly introduced into gardening. It most closely resembles the atmosphere of the rain forest, and we all know how the rainforest grows. The system works by spraying the roots with a mist that consistently provides nutrients to the roots while also allowing oxygen to get to the roots. This allows for the most potent and powerful mixture in all of hydroponics known today: perfect amount of nutrients and perfect amount of aeration. Aeroponics has been known to significantly increase yields and the only reason is because of the nutrient to air ratio. Remember that fact when you choose to not add an air stone to a different setup because of the additional cost.